It’s gotten to be so cold outside again, and the new hole in my boot makes me mad and sad, then wanting for some of this Meccan sweet coffee. You may be looking at the contents at the mug and digitally judging me for my misleading recipe naming skills, but bear with me for a second. If you’ve been here before, you know that I’m doing my Master’s in Translation Studies (OHMAHGAH graduating in 2 months that’s scary). My program has students from all over the world, actually most of the students are international students, which means that it’s such a great intersection of culture and language. Two of my fellow classmates are from Saudi Arabia with a mixed background that gives them access to such a wonderful mix of cultures with amazing food. My friend Wasilah really wanted to share this recipe with me because she knew I would love it (and I did). 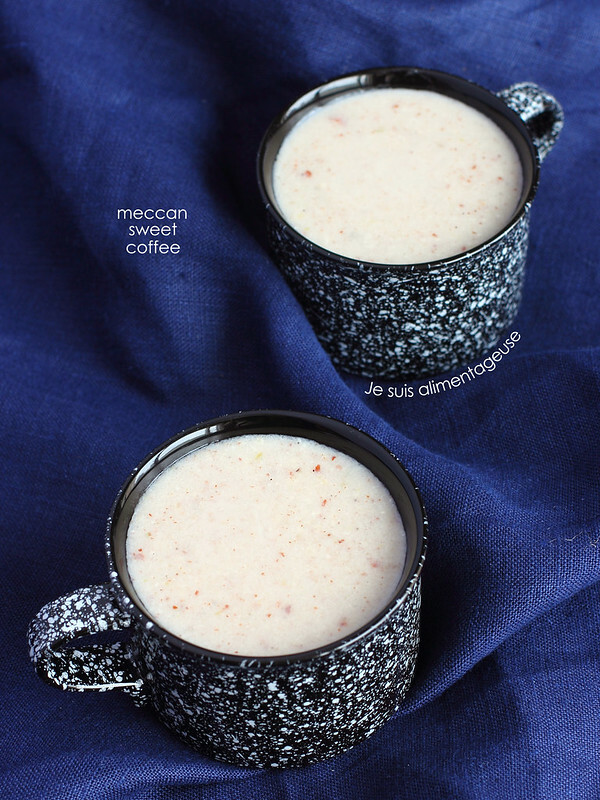 Meccan sweet coffee is not coffee at all. It’s actually more of a sweet, almond soup with the floral scents of rose water and ground cardamom permeating through each spoonful. The flavour wraps itself around your tongue and you get that lovely bite of roughly sliced almonds that add the flecks of brown to the drink. It’s absolutely wonderful and must be served hot to serve as that warm hug in a mug. Wasilah explained that this recipe is a very old Meccan drink that’s made traditionally for good luck and fortune in the new year. You make it for your loved ones and wish for a prosperous new year! I was literally stuffing my face until I was full, and then as soon as I had room to eat more, I had an orange. I guess what I can take away from this is that in order for you to keep from making bad food choices, you need to stop surrounding yourself with the opportunity to eat unhealthily. While yes, I ate enough oranges to make mimosas for 4 people, those 15 oranges could have easily been 15 oreos, or 15 cookies, or 15 other unhealthy things that would have satisfied my sweet tooth. To see what my fellow H&H friends wrote this week, check out the links below! Stir almond milk over medium heat until steamy and barely bubbling, about 3 minutes. Whisk in rose water, sugar, and rice flour until the mixture is thickened, about 2 minutes. Whisk in the ground cardamom and processed almonds, again until it's almost as thick as pancake batter. Serve immediately, spoon is optional but highly recommended! Hahah yeah nut butters are also super dangerous. And crackers. I go through sleeves upon sleeves of crackers.